Shooting Florida school: Multiple dead and the shooter is in custody. Teenager opens fire at Florida high school, leaving multiple dead and hundreds fleeing in terror. A 19-year-old gunman has opened fire at a Florida high school he was previously expelled from, killing 17 people before he was arrested. 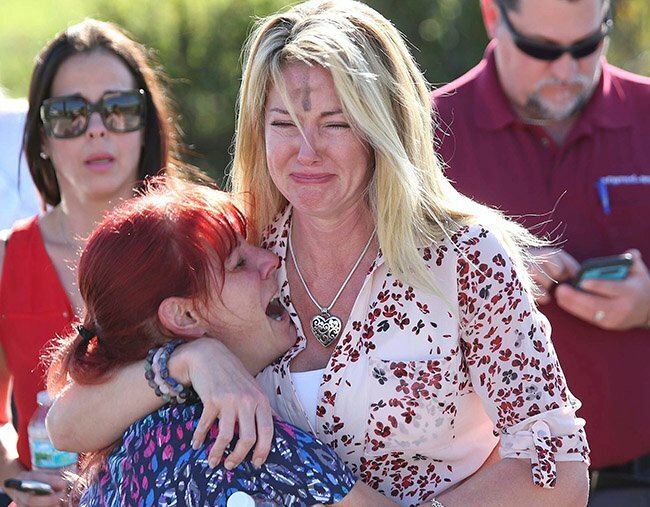 The violence erupted at Marjory Stoneman Douglas High School in Parkland, about 72 kilometres north of Miami. Live television footage showed students streaming out of the building as dozens of police and emergency services personnel swarmed the area. The gunman was identified as Nikolas Cruz, who previously attended the school and was expelled for unspecified disciplinary reasons, Broward County Sheriff Scott Israel said. “It’s a horrific situation,” Broward Country Schools Superintendent Robert Runcie told reporters separately. Twelve of the dead were killed inside the school building, two others just outside, one more on the street and two other victims died of their injuries at a hospital, Israel said. LISTEN: Amelia Lester explains why gun laws in the US are unchanging, despite tragedy after tragedy. Post continues after. He said the victims comprised a mixture of students and adults. Staff and students told local media that a fire alarm went off around the time the shooting started, sparking chaos as some 3,000 students at the school first headed into hallways before teachers herded them back into classrooms, to seek shelter in closets. Kyle Yeoward, a 16-year-old junior, said he was in the bathroom on the second floor of the building on the campus where most of the shooting took place, when he heard two shots. Panicked parents checked on their children. "My daughter, as of right now, she&apos;s still trapped in a closet. She&apos;s afraid to speak," a man who identified himself as Caesar Figueroa and said his daughter was inside the school, told CBS News. "I told her, &apos;Don&apos;t call me, because I don&apos;t want no one to hear your voice.&apos; So, she&apos;s still trapped in a closet in there." WATCH: Witness to Florida school shooting speaks out to @nbc6. While you’re offering your thoughts & prayers for the senseless gun violence at Parkland High School today in Florida use your voice to call your Senator(s) at 202-224-3121 & demand #GunControlNow. "It is just absolutely horrifying. I can&apos;t believe this is happening," Lissette Rozenblat, whose daughter goes to the school, told CNN. Her daughter called her to say she was safe but the student also told her mother she heard the cries of a person who was shot. "She was very nervous. She said that she could hear the person who was shot crying out for help," she said. "My prayers and condolences to the families of the victims of the terrible Florida shooting," U.S. President Donald Trump said on Twitter.